In her first game back in Seattle after being traded, Sydney Leroux was not able to help her new team beat her old team. Megan Rapinoe stole the show when she recorded her first ever NWSL hat-trick. 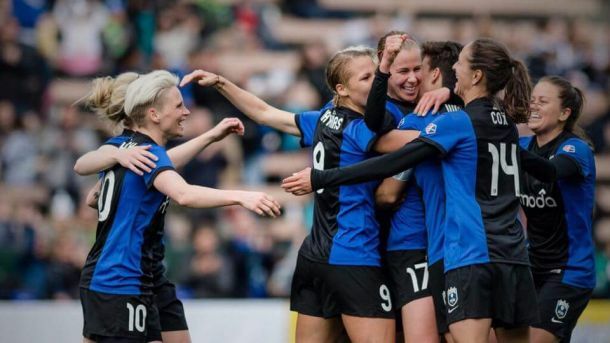 The Seattle Reign were looking to show that the 2014 NWSL season was no fluke and they got the 2015 season started off in a huge way. They absolutely dismantled the Western New York Flash 5-1 on their home field in front of 2,642 fans. One story line going into this match was the fact that former Reign forward Sydney Leroux would be facing the team that had just traded her away the week before. In the end, Leroux was not able to inflict any damage on her former team as the Reign defense did well to keep her away from goal. What turned out to be a huge story was Megan Rapinoe scoring her first ever hat-trick in NWSL as well as the first in Reign history. The 2014 season was a bit of a disappointment as Rapinoe missed most of it due to injury. She was able to contribute late in the season, but it was nowhere near what would make her happy. Seattle got on the board first in the 25th minute after Rapinoe was able to send in a long cross into the box. Jessica Fishlock was able to find the ball that she one-touched into the lower left of the goal for her first goal of the season and the ninth in her career. It was also her fourth goal against the Flash. The Reign almost got on the board again in the 37th minute as Kendall Fletcher was fouled in the box. The 2014 League MVP, Kim Little, stepped up take the shot, but she fired her chance wide of the goal. Less than ten minutes after the second half began, the Reign added another goal when Beverly Yanez (Goebel) had the ball laid off to her by Little at the top of the box. Yanez was able to settle and fire the shot past the Flash goalkeeper, Sabrina D'Angelo. The Flash was able to cut the lead in half in the 68th minute when Jordan Angeli was able to get her shot past Reign 'keeper, Hope Solo. Leroux was able to find Samantha Mewis in space who then crossed the ball to Angeli at the top of the box. It didn't take the Reign long to get that goal back. Just three minutes later in the 71st minute, Rapinoe scored her first of the night. She received a cross from Merritt Mathias and was able to rise above her defender to head it into the net. In the 74th minute, Rapinoe scored again. The original shot by Fishlock was stopped, but Rapinoe was able to head in the rebound. 12 minutes later, Rapinoe finished off her hat-trick in the 86th minute. Rapinoe was able to get behind the Flash defense after a give and go with Fishlock and found herself in a one on one situation with the 'keeper. Rapinoe was able to fire the fifth and final goal of the night past D'Angelo. Not a bad way to start your season as the defending shield winners. The Reign will now start a two game road trip. Their first stop will be this coming Saturday, April 18th in Chicago. Kickoff is scheduled for 5pm EST. The match will be available via a live, high-definition web at YouTube.com/NWSL.